Rumblestrip brings together works by six artists that carry a sense that something is not going right, that there are signs we should be heeding. They find the differences between subsequence and consequence, a link made between things happened or happening and things yet to come. They pull together precedent and prediction, the unreachable past and an uncertain future, pointing to the signs and signals that things are about to change, there are other paths than the ones we are currently treading. g39 lifer Freya Dooley’s work combines literary and pop cultural references to create unstable semi-fictions and dense soundtracks. Often referring or returning to anxious states, her work attempts to articulate an inside turned out. The song settles inside of the body it borrows deviates from existing literary narratives to explore the potential and limitations of the voice, consumed bodies and occupied minds. We're looking forward to Venice this year, supporting the mentoring programme for Sean Edwards curated by Marie-Anne McQuay - a brilliant combination joining an exciting line-up including Charlotte Prodger for Scotland, Cathy Wilkes for the British Pavilion, Eva Rothschild for Ireland and Laure Prouvost for France. I like the idea of folding something wholly mundane, like lost utterances, into something as entirely ecstatic and elevated as choral song. Alongside Rumblestrip we are showing a project by Tom Cardew, who has worked with g39 over the last year to develop a new installation. In a space that looks like a gallery store, a series of linked narratives are played by computer generated avatars. Dishevelled and not quite of now, they are ghosts. Their voices and stories stand out as distinctly human, as they go off on tangents, stumble over words and forget what they are discussing, drifting from sense to nonsense. The group gabble on, seemingly disconnected and separate, before starting to sync up as a choir. Red Route is an annual walk between Cardiff and Merthyr Tydfil. Initiated by artist Becca Thomas as part of madeinroath in 2014 it is now in its sixth year. It has taken the shape of a march, a nightwalk and a procession. It is a collective action and a way of joining upcommunities along the route and a physical tracing of the relationship between history and the present, between the port of Cardiff and the industrial feeder towns that grew it. Starting at g39 the walk is twenty-seven miles and walkers can join in and step out along the route. This year there will be a trip to the hot springs in Taffs Well and a stop in Quakers Yard as well as other interventions along the route. In May when I come back to the library at g39, I might have a bit of a party, that be OK? Music, noise, visuals, dancing, drink, caterwauling, people dying in the corner - that sort of thing. I'll clear up afterwards. Artist Rhiannon Lowe marks the end of her stay in the g39 library. The use of libraries can seem like an oddity in the age of the internet - we cling to them as a concept, for nostalgia but also see the value in cataloguing, collecting and preserving. 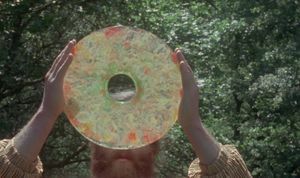 Artist Thomas Goddard presents the culmination of his research into the moving image collection within the g39 library. Join us for a screening of films and music presented by Matthew Robert Hughes from Legion Projects and Chapel on The Green, Glasbury. He has made a selection from films that combine contemporary troubles and historical myths and legends. With episodes of The Owl Service, Alan Garner, TV series 1969, alongside clips from Children of The Stones, Raven, Penda's Fen and Moondial. Many of these films made for TV have Wales as a central character and backdrop. A place of refuge, survival, omens and signs. I work with writing, moving image, sound and performance. My work often combines literary and pop culture references to create fragmented monologues, dialogues, soundtracks and auto/biographical semi-fictions. Artist Freya Dooley hosts an event to mark the end of her research within the g39 library. Informal chat over breakfast, tea and coffee, Breakfast Club is a way of meeting other people in the visual arts community and catching up on what's going on. Free, everyone welcome. The g39 Fellowship is a new initiative that fosters, extends and reinforces a peer group of artists. Five artists have been selected to take part in a structured programme of studio practice and self-directed research at g39 over a period of two years. Starting in April the artists will be working here at g39 to develop new work and establish networks both here in wales and across the UK as part of the Freelands Artist Programme alongside equivalent initiatives organised by PS2 in Belfast, Site Gallery in Sheffield and Talbot Rice Gallery at the University of Edinburgh.